Today’s Flash Back Friday comes from Episode 91, originally published in May 2012. Following a cancer scare, during which he was approached by researchers and asked about his exposure to chemicals from common household items, i.e. 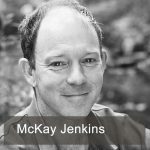 weed killers, glue, detergents, plastic meat wrap, etc, McKay Jenkins set about doing his own research for clues into the toxins that are getting into our bodies and environment. Jason Hartman and author, McKay Jenkins, discuss the findings that led McKay to write his book, What’s Gotten into Us? Staying Healthy in a Toxic World. McKay was lucky that the tumor in his abdomen was benign, but during the weeks up until his surgery, he came across a lot of people with various types of cancers and he wondered just how many chemicals we’re exposed to every day. The number was staggering. The toxins are leached into our environment and ingested through our air, food, water, and numerous household items and lawn care products. Water samples show pharmaceuticals; mattresses contain neurotoxins that break down over time; children’s clothing contains flame retardants; many pots and pans are coated with Teflon. The list goes on and on. Body burden studies reflect the amount of toxins in a person’s body and the findings reveal high levels of hormone-disrupting chemicals in blood samples. McKay talks about the regulations or lack of regulations that are favoring large corporations rather than protecting consumers. Maine has been able to pass the most effective health laws in the United States that favor its citizens. The corporatocracy wants consumers to shop without thinking; cosmetics are full of chemicals that are actually illegal for use in Europe because of their carcinogenic properties. For instance, lipstick contains lead and other cosmetics contain industrial strength degreasers that are used on engines. Warning labels are not required on cosmetics, yet the same degreaser found in the hardware store carries a warning lable. McKay wraps up the interview with suggestions for healthier living and advises consumers to be more aware of what is going into and on their bodies. McKay Jenkins has been writing about people and the natural world for 25 years. In addition to his book, What’s Gotten into Us, McKay is the author of several other books. He is also the editor of The Peter Matthiessen Reader (Vintage, 2000), an anthology of the American nature writer’s finest and most enduring nonfiction work. McKay holds degrees from Amherst, Columbia’s Graduate School of Journalism, and Princeton, where he received a PhD in English. A former staff writer for the Atlanta Constitution, he has also written for Outside, Orion, The New Republic, and many other publications. Jenkins is currently the Cornelius Tilghman Professor of English and Director of Journalism at the University of Delaware, where he has won the Excellence in Teaching Award. He lives in Baltimore with his family.